Considering the carnage to both capital and labor (which covers just about everybody), even a Ronald Reagan could not have survived. The fact that John McCain got 46 percent of the electorate when 75 percent said the country was going in the wrong direction is quite remarkable. 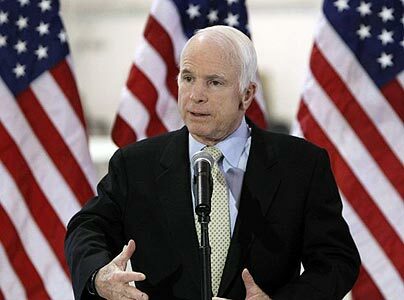 However crushing the external events, McCain did make two significant unforced errors. His suspension of the campaign during the economic meltdown was a long shot that not only failed, it created the McCain-the-erratic meme that deeply undermined his huge advantage over Obama in perception of leadership. The choice of Sarah Palin was also a mistake. I'm talking here about its political effects, not the sideshow psychodrama of feminist rage and elite loathing that had little to do with politics and everything to do with cultural prejudices, resentments and affectations. Palin was a mistake (" near suicidal," I wrote on the day of her selection) because she completely undercut McCain's principal case against Obama: his inexperience and unreadiness to lead. And her nomination not only intellectually undermined the readiness argument. It also changed the election dynamic by shifting attention, for days on end, to Palin's preparedness, fitness and experience -- and away from Obama's. McCain thought he could steal from Obama the "change" issue by running a Two Mavericks campaign. A fool's errand from the very beginning. It defied logic for the incumbent-party candidate to try to take "change" away from the opposition. Election Day exit polls bore that out with a vengeance. Voters seeking the "change candidate" went 89 to 9 for Obama. McCain ran a valiant race against impossible odds. He will be -- he should be -- remembered as the most worthy presidential nominee ever to be denied the prize. I very much agree with the first part of the quote, much less with the second one. Still wandering around the States? Actually a great editorial (and a very interesting blog). I just got back today. Was impressed by so many things, and of course happy to be there during the last days of the campaign and the election. A republican friend of ours who picked us up at JFK in NY was of course unhappy about the final outcome. I agree that John McCain was a man full of good qualities and that the economy and the choice of Sarah Palin didn’t favour him. My hope – as you can guess - is that Obama can really make history and produce that change America needs. Needless to say, the challanges are enormous.